Completed in 1848, the Erie Canal was built 70’ wide and 9’ deep and ran 400 miles from Albany and the Hudson River to Lake Erie connecting the Atlantic to the Great Lakes. After 1920, with the advent of the automobile and later the opening of the St. Lawrence Seaway, the canal was filled and paved in many places. Between the City of Syracuse and Town of DeWitt the canal has been filled in and resurfaced with asphalt as Erie Boulevard, a six lane road for suburban big box retail buildings and parking lots. The boulevard is lacking sidewalks, pedestrian facilities, bus stops, and bicycle lanes. Every day, people walk the shoulder-less edge of the boulevard dangerously close to traffic. Buried beneath this four-mile stretch of Erie Boulevard lies the historic stone canal – a lost landscape hidden beneath the surface. 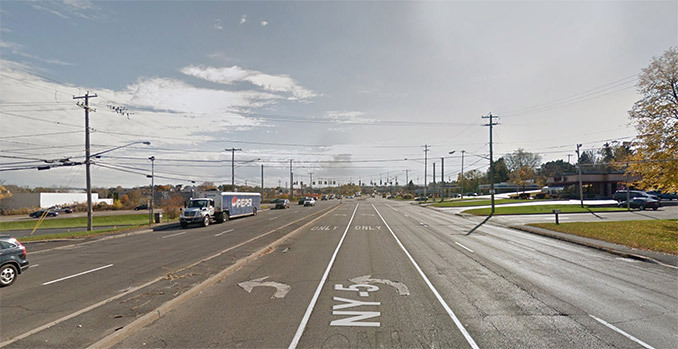 Currently surrounded by unplanned sprawl, Erie Boulevard is six lanes of asphalt and the occasional median. Parking lots for big box retail tend to occupy the North side of the boulevard while fast food restaurants predominate the South side. There are no sidewalks or bicycle lanes. Traffic studies have shown that Erie Boulevard could even be closed completely with traffic rerouted to other roads. The former Erie Canal lies just beneath the surface of the roadway. We employed a subtractive strategy – a series of cuts that not only reveal the archeology of the Erie Canal itself but also its latent performance as an urban and ecological device. By rerouting the freeway traffic to existing roads to the north of Erie Boulevard the boulevard’s road width can be reduced, transforming the boulevard into an extension of Erie Canal State Park to the East and connecting the State Park directly to the City of Syracuse. 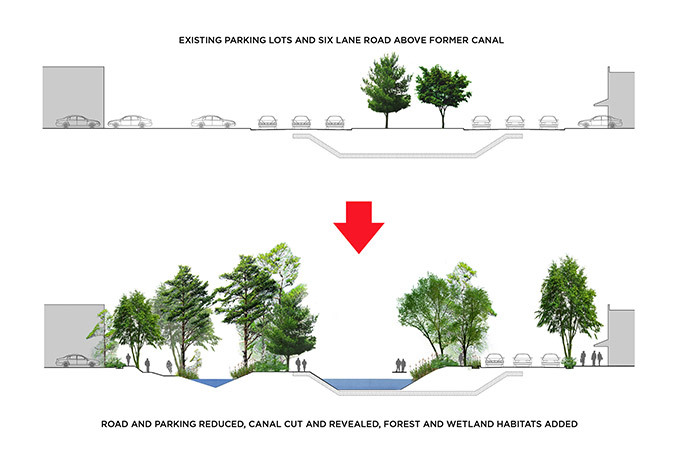 Revealing the Lost Erie Canal allows the cross section of the roadway to be repurposed as an urban park space in the city charged with new wetland and forest habitats for common and endangered flora and fauna species in upstate New York. New urban spaces and ecologies are created that not only connect Syracuse and Dewitt to the Erie Canal State Park, but also spill-over their urban and biological diversity into nearby communities and natural habitats. 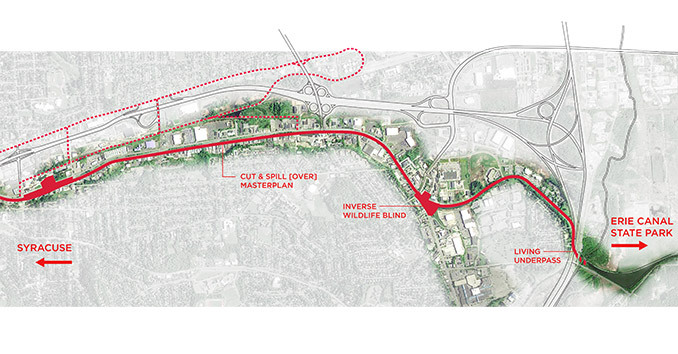 Significant stretches of the asphalt roadway are to be replaced with pathways for walking, cycling, horseback riding, swimming, and kayaking both following and weaving across the space of the canal. The addition of water and vegetation forms a park with two sides – one to the North side of the canal flush with wildlife, acting as an ecological buffer to the big box retail behind – and another recreational park facing a densified urban street on the South side of the canal. 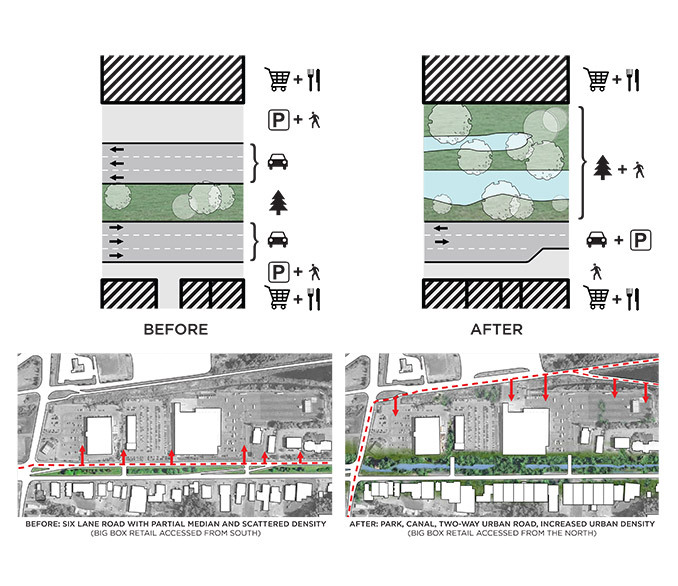 Portions of the North half of the canal are excavated to the old stone canal walls forming hard urban edges for seating and a forest buffer between the canal and big box retail farther to the North. The South side is cut to form a variegated wetland condition forming a diverse wetland habitat the former canal never had while opening to a densified urbanism to the South. In order to connect the site to its surroundings a depression is made that allows for a gradual pedestrian ramping under Bridge Street which receives heavy traffic from Interstate 690. The path way is literally cut through the wetland forming a depressed wildlife viewing area. 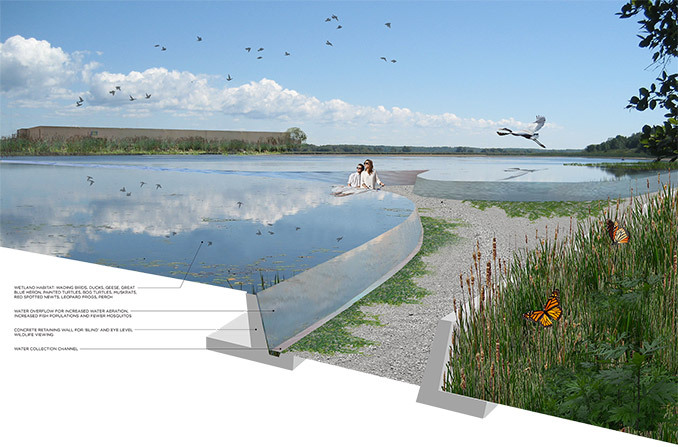 The lower perspective across the water allows for a more direct experience with the flora and fauna of the site. Water flows over the edges of the cut to expose the water and create additional flow and aeration for aquatic fauna. While people are viewing their environment, there may also be occasions where the relationship between the traditional observer (human) and observed (fauna) invert -the wildlife may also be watching us. Interstate 481 is the most significant barrier to connecting Syracuse to Erie Canal State Park. Bridging over the highway would invariably require an on-grade crossing for pedestrians, cyclists, and horseback riders at Butternut Drive. A bridge would be costly and incur weight restrictions, limiting the people and fauna that could cross. 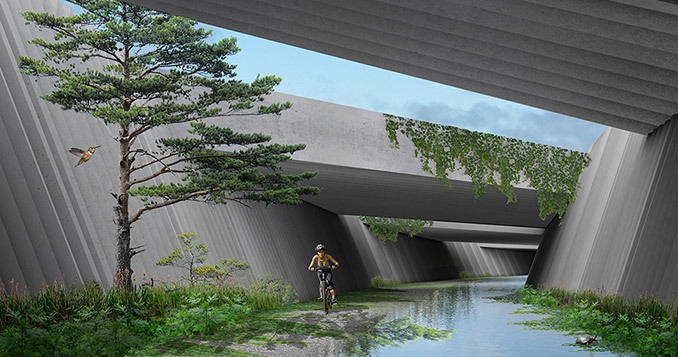 An underpass would create a new type of space in the park – a dramatic gateway that follows the exact path of the former canal, seamlessly joining Erie Canal State Park with a new Park at Towpath Road and Erie Boulevard. 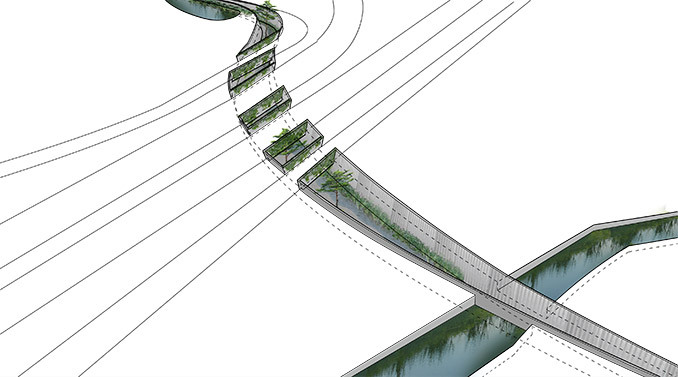 As a cut in the landscape connected to the ground it would create new habitats, large light wells in the medians would create dramatic daylighting conditions.